Will the Jokers plan be revealed! Will it be horrendous, morbid, and congealed! Or will it remind me of a fiddler. Who used to play the Riddler. And is now very good at track and field. Yeah! No kidding. 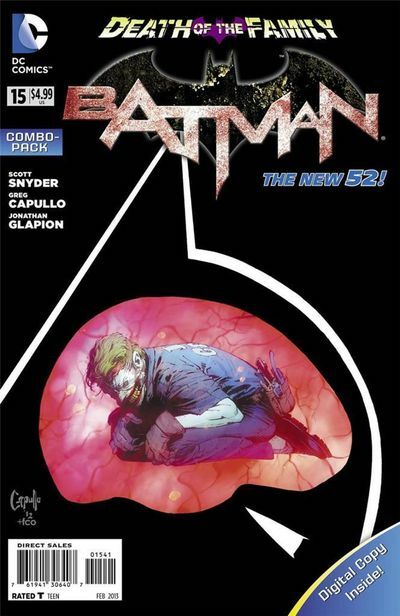 Just ask the ripped creative team of Writer: Scott Snyder; Artist: Greg Capullo; and Publisher: DC Comics in January 2013. Or don't. See if I care. Holy cross-over event! Isn't life a nightmarish experience for Batman within this story entitled, 'But Here's The Kicker'! For a start, he just about manages to get away from the Joker by the very skin of his Bat-teeth. Then, back in the Cave, he gets a good telling off by the Bat-Clan, because he didn't tell them about an encounter he had with the Harlequin if Hate many-many years ago. And finally, after scaring some chap called Dylan McDyer sh*tless, Batman ventures into Arkham Asylum to continue this sordid tale. Meanwhile, in the back-up feature, the Joker tricks the Riddler into escaping from Arkham, before coaxing him into his devilish master-plan. 'Look into his eyes and tell me he's a man. Tell yourself he can't know the things he says he does. He can't know your fears. But he has Alfred. He has your friend. And his eyes... you have studied the human eye. There are six eye movements that reveal motive, then fifteen versions of each one. On everyone else you face -- even the most hardened criminal -- the pupils expand or contract depending on emotion. Happiness, laughter, affection -- the pupils open. Fear, anger, hatred -- the pupils close. But not on his'. I liked reading this passage because it revealed Batman's current state of mind, and was very educational as well. Nuff said. Hands down, the stand out scene for me was seeing all of the Bat Family in one scene together. Wow! I've always liked this type of thing. It just goes to show that unity and comradeship are always much more personable to follow than an action based adventure. My one small gripe with this story was the transitional scene between Batman's escape and him talking to the Bat-Clan. No. I'm not referring to the dream sequence. I liked that. But rather, the manner in which his escape wasn't illustrated within this tale. One minute he was drowning, and the next -- ping -- he was saved. Please note: this is merely a small gripe. There was a subliminal message impregnated into this yarn, which highlights the biggest difference between Batman and the rest of his gang. Well, if you think about it for a moment or two. Whilst the rest of them were worried about the Joker knowing their secret identities or not, Batman kept a level head on, and just continued doing what he had to do. That was very 'Dirty Harry', wasn't it? BATGIRL: Still swaying to my horticultural casting-call theme, dear reader, and in a right mood to cast beautiful Bab's as a beautiful flower called the 'Fleur De Lin' -- also known as the 'Blue Flax'. This is mainly because they are both pretty and both blue. Agreed? HARVEY BULLOCK: Is it just me or does this gruff-looking cop look like a marrow to you? Not to eat. Of course not. This vegetable is too healthy in hindsight. But visually speaking I mean. 'He Who Laughs Last, Laughs Most' -- Yahoo Answers. Conceptually this is a 'did he / didn't he' type of a tale. Therefore, I feel compelled to compare it to the Bobby Womack song 'I Wish He Didn't Trust Me So Much'. OK, so things are starting to take shape in this 'Death in the Family' story-line. At the moment, I'm fairly confident that the Joker is using Batman's rogue's gallery to instigate his revenge. Moreover, I don't really feel that no physical harm will come to any the Bat Gang either. Still, emotionally, I hope that this arc is more than just an 'event'; and something will grow roots after it has been put to bed. But what could it be? Can you guess? Maybe Alfred will be someone who'll take the brunt of the Jokers shenanigans? Or quite possibly it could be Damien too? And what about the rest of the Bat-Buddies? Will Barbra stop wearing her dancing shoes once more? Will Nightwing have to wear a new wardrobe again? Ouch! That's the best thing about this story I find -- the questions -- please let them continue rocking and rolling into view.